Now, I present to you all, The World Cromwell Made on December 25, 1955. The reigning superpower on the continent and dominant power in the Catholic world is, naturally, the Empire of Maryland, ruled from the metropolis of St. Mary's City—a city that rivals London in size and grandeur. The nation was formed when Charles II finally declared Britain a lost cause and set up his governmental power base in the Americas, deciding to resign himself to rule over the New World. In the end, this would prove a wise choice, as Maryland quickly expanded to swallow up all of England's former colonies, save the Puritan New England colonies. Maryland, over the years, grew rapidly due to abundant resources, a high growth rate, steady immigration—particularly by English, Scottish, and Irish Catholics—and powerful allies in France and Austria, who still recognized Maryland as the legitimate English government, even if the nation gave up any ideas on retaking the British Isles. With all those factors, Maryland (then known as the Kingdom of Maryland) quickly spread across the East Coast, taking the Dutch and Spanish colonies there in a series of brush wars with the dying colonial powers. From there, Maryland pushed inland, settling the interior relatively uncontested due to alliances and the weakness of the other colonial powers. The Commonwealth, meanwhile, constantly harassed the Catholic nation, but was uninterested n starting a full war with Charles' descendants, and so elected to let the nation live on. The 19th century became Maryland's first golden era, as the kingdom was converted to an empire and rapidly expanded against the dying Spanish colonial empire all the way to the west coast. 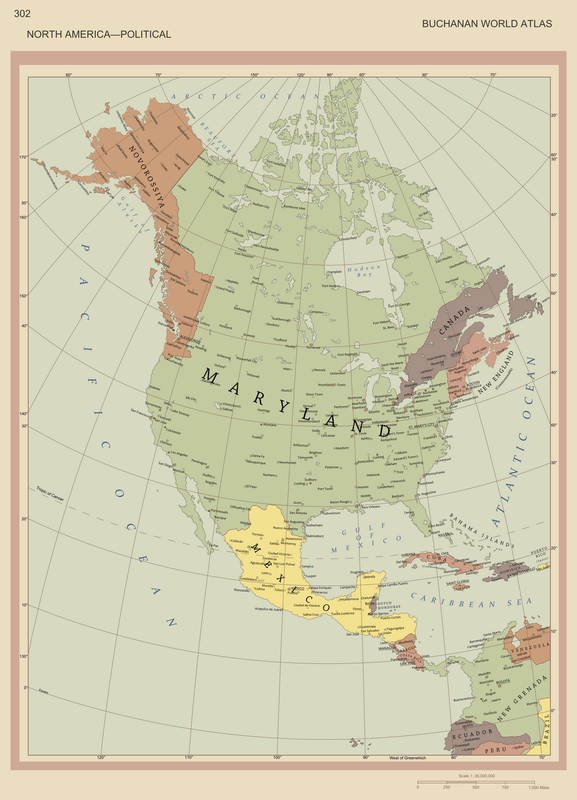 The Empire of Mexico itself was beaten badly in a border-conflict-turned-war, and forced to focus its power south while Maryland dominated the North, eventually consuming all territories not firmly claimed by Russia, France, or The Commonwealth. During that century, The Commonwealth remained a stubborn thorn in Maryland's side, due to the highly-effective and professional New Model Army and Commonwealth Navy that remained superior to anything Maryland could throw at it. Two wars between Maryland and New England only resulted in bloodied noses for Maryland as Boston refused to yield in the first war, and in the second Maryland's soldiers found out how much of a fortress Halifax had been turned into, suffering four times more casualties than their Commonwealth counterparts. In the end, the two rival nations settled into an uneasy peace with war deemed too costly to be effective. Industrialization, which began in The Commonwealth and quickly spread out, took hold of Maryland's society and reinvigorated it, turning the quiet, conservative Catholic communities into booming factory towns, particularly around the Great Lakes region. New jobs and opportunities abounded, and Maryland rose as one of the world's largest economies by way of mass market capitalism. Goods were overflowing from every corner of the empire and trade with Maryland's allies Russia and France only made the nation richer. Now, the year is 1955, and industrialized life has settled firmly into Maryland. The Empire stretches proudly from sea to shining sea, a victor in Europe's titanic Grand War and the workshop of the world. Christmas has come once more to the continent, overflowing department stores and family-owned retail outlets with goods made in factories hugging the Great Lakes or the Mississippi River. Children and adults alike, tired from the previous night's Christmas Mass, listen to Emperor Benedict II's traditional Christmas broadcast via telephone (which would be called, in our world, a radio). Christmas hymns are sung and gifts exchanged in the light of Christmas candles as music plays on the telephone or some particularly pious families tune in to Pope Pious XIII's broadcast from Rome, in the Italian Papal Republic. It is a broadcast also listened to in the French and Austro-Bohemian-Bavarian empires, as well as French Canada, which has itself adopted a strange hybrid of Marylander and French cultures and styles. The Russians of Novorossiya receive gifts from the Three Magi and celebrate another good year, despite a particularly cold year, by the light of fireplaces. They are a hardy, strong people concentrated around the Pacific Northwest, and who consider themselves all but independent from the Eurasian empire that stretches from Petrograd to Changchun. Still, it is Christmas, and thus no reason to get angry—that can wait for after the New Year. Meanwhile, New Englanders remain in contempt of the pompous Catholics surrounding them, refusing to celebrate the "heretical" holidays of the Catholics and sticking to their Puritan beliefs...on paper, anyway. In reality, The Commonwealth celebrates New Year's in more or less the same way, just making schoolchildren wait an extra few days to have some fun. Instead, rich New Englanders fly out on fast-travel rocketplanes to Commonwealth Cuba—taken long ago from the Spanish—to enjoy a period of relaxation and escape the harsh winters in the north. In all, 1955 has been a year of peace and goodwill, and it is hoped that 1956 will be the same. Maryland and New England may eye each other warily over the border and the Populist Federation of Brazil may send more threats to New Grenada, but peace still reigns over the world, one won through hardship but hopefully one that will last as well.